Throughout 2014 and early 2015 the much-loved Lido at Ynysangharad War Memorial Park will undergo an ambitious £6.3 million refurbishment. 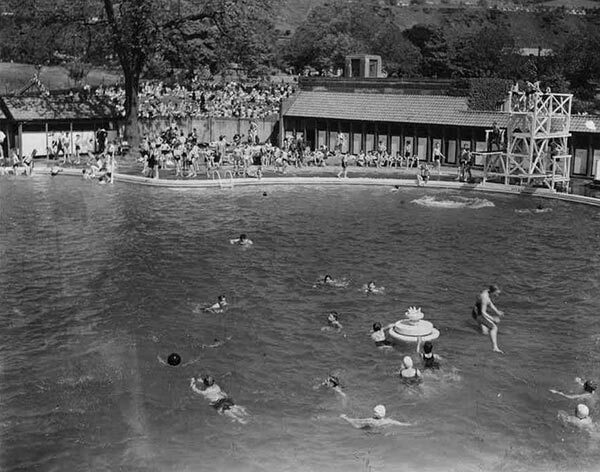 Spearheaded by Rhondda Cynon Taf Council with financial support from the European Regional Development Fund through the Welsh Government, Heritage Lottery Fund and Cadw the project will totally transform the landmark Grade II listed lido. As a jewel in the Pontypridd crown, it is one of the most iconic open-air lidos in the UK. The project will include restoring and remodeling the Lido with three heated swimming pools that offers maximum flexibility to accommodate different age groups and facilitate a varied and fun activities programme. It will also include a café and a state-of-the-art dry play area. The restoration, which is due for completion in summer 2015, will include new features such as external and internal showers, heated changing facilities and a learning and visitors’ centre, permanently depicting the history of the Lido and the wider park. A designated learning space will be used by a variety of school and community groups, as well as being available for hire for meetings and training activities by local organisations. Restoring the historic grade II listed lido to a high standard. Reopen the lido as a heated facility, with three pools for different uses: a main pool, an activities pool, and an attractive semi circular splash pool for small children. Construct a high quality café to serve both the lido and wider park. Construct a new changing block in line with modern expectations. Create a state of the art dry play facility open year round. Built in 1927 in an arts and crafts style the lido has a distinctive Mediterranean influence and, with its swimming pool, bath gallery and changing rooms the lido complex is unusually large, accommodating up to 1000 people in its heyday. During the post-war years the lido remained a popular attraction for the local community but by the early 1980s the complex fell into decline and was closed in 1991. It is set to re-open in 2015 as a major visitor and tourist attraction. Should you require any further details at this stage then please do not hesitate to contact us.